For each of the last three years, the Washington Kastles (The District’s World Team Tennis franchise) has played on a bespoke temporary court at the corner of 11th and H Street NW across from the Grand Hyatt. 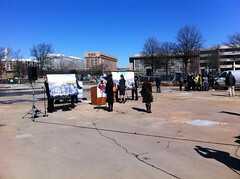 This season, with construction slated to begin at the city center site in April, the team has had to put together other plans. The Kastles will play in a temporary stadium on the new site at 800 Water St SW on the Waterfront, between Zanzibar and Phillips, for the next two years. 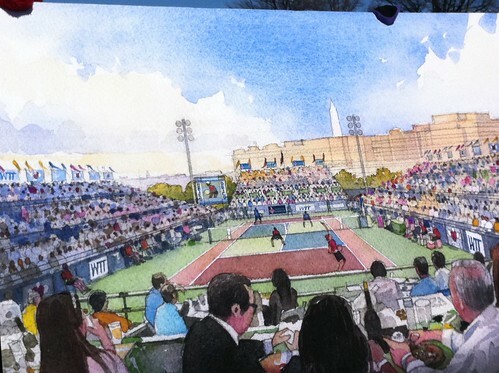 The temporary stadium will closely resemble the temporary stadium built at 11th & H, but will remain up year-round and be programmed by the Kastles and their partner PN Hoffman. The Kastles season runs July 5th through 24th, but they expect to have the stadium up by April, so we may see some community events at “Kastles Stadium at the Wharf” shortly thereafter. Kastles’ owner Mark Ein and PN Hoffman CEO Monty Hoffman have said that they hope to have pop-up events at the new stadium, including movie nights, farmers markets, and other sports events. The new stadium is along Metrobus and Circulator Bus routes, and just three blocks from the Metro at L’Enfant Plaza and Waterfront-SEU, making it fairly transit-accessible. There’s also a parking garage immediately below the facility, and nearby parking facilities as well. The facility benefitted from a DOT Federal Grant to improve the waterfront, and is part of a $2B project to revitalize the waterfront over the next decade. After two years, the Kastles and PN Hoffman will re-evaluate where to put the Kastles, as the space between Phillips and Zanzibar is slated to be a 4,000-seat music hall. It’s possible the Kastles will move indoors for their month-long season and play there, but it’s also possible they’ll play further down the waterfront in another permanent stadium.